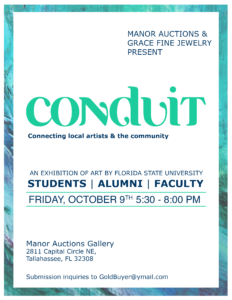 Manor Auctions and Grace Fine Jewelry are hosting an art exhibition for Florida State alumni and current students on Friday, October 9th from 5:30 to 8:00 pm. Grace Fine Jewelry and Manor Auctions are locally owned businesses, and are excited to work with emerging artists in the community. This is a fantastic opportunity to introduce your work to Tallahassee residents who appreciate and invest in fine arts on a regular basis. Artists will keep 100% of the profits on their work. This event is family-oriented, so please maintain a standard of tasteful work. Submissions will be reviewed on a case-by-case basis. Submissions should be 2D or 3D and easy to hang or display on a pedestal. Paintings, drawings, photography, ceramics, and sculptural works are all acceptable media choices. If you work in a medium not listed here please contact Conduit and efforts will be made to work with you and your media. Submit entries with your first and last name, dimensions, titles, materials used, and prices to their email with the subject line “emerging artist exhibition” for review. The deadline for submissions is Tuesday, October 6th.